We've documented how WorldNetDaily was an early cheerleader of the standoff between Cliven Bundy and the federal government, even touting how armed militias had "made the confrontation over Bundy’s use of federal land for grazing a rally cry." WND editor Joseph Farah ranted against the "Gestapo tactics of the federal government in dealing with honest, hard-working Americans who live off the land – our land." But the feds have backed off, the militias are still hanging out and threatening people -- which, curiously, WND has not reported. And suddenly, Farah is singing a different tune. No Americans should be pointing guns at other Americans over grazing fees that are allegedly owed by Bundy. There’s no need for that. This is the kind of conflict that should be resolved peaceably in courts of law as well as in the court of public opinion. It’s not life-and-death battle. It’s time for both sides to recognize this is not a matter calling for bloodshed and violence. Period. End of story. Emotions are running high over the dispute – and that’s not good. It’s in everyone’s best interest to take a calm, cool look at the facts and stand down. We don’t need another Ruby Ridge or Waco over a bunch of cows. No one should be welcoming or preparing for a shoot-out. It’s insanity. No one wins from such a scenario. To date, no one has been seriously hurt or killed. That is a positive thing. It’s not a time for escalating the crisis or erecting barricades. It’s a time for defusing the crisis. Both sides need to calm down and get rational. This matter only rises to a life-threatening one if Americans – on either side – react without thinking. No one benefits from a shooting war. But wasn't WND hoping to benefit from a shoot-out it could exploit as another example of President Obama's supposed lawlessness? It exploited Ruby Ridge and Waco, after all -- there are hundreds of articles on both in WND's archive. Farah goes on to complain that "the FBI is investigating supporters of Bundy who allegedly pointed guns at armed federal agents." Allegedly? 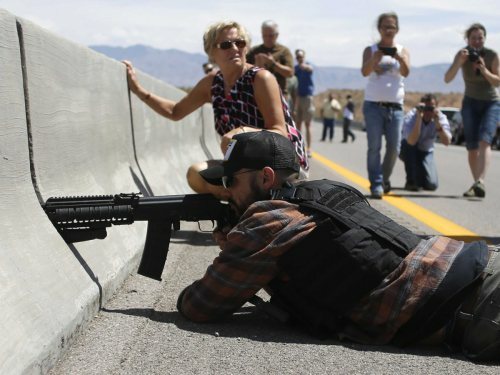 Who does he think this militia member is "allegedly" pointing his weapon at? For all the evidence that the militia thugs are continuing their thuggery, he won't call them out the way he calls out the government. He merely laments, "There’s irrationality on both sides. Both sides have been responsible for incendiary rhetoric. There have been misguided and baseless charges of racism. And there has been too much cowboy swagger, too." Cliven Bundy is not a wealthy man. Clearly, he does not have $1 million to pay the government for the grazing fees it claims. You might expect reasonable people in government to look at the situation, slap a lien on the property and take its cut when Bundy dies or sells his land. That would be logical. But it seems unlikely for whatever reason. You might also expect the government to do what if often does in other much more serious disputes like the Middle East – negotiate endlessly to find a compromise solution. That would be logical, too. But it seems unlikely for whatever reason. Farah seems to have missed the fact that the federal government has been working for 20 years to reach a settlement with Bundy. It seems the government has been more than reasonable in waiting that long to move against Bundy's lawlessness. How nice of Farah to suddenly want to de-escalate the Bundy situation. He should have thought about that before he decided to escalate it.